This weekend’s race at Richmond Raceway marks the second in the Monster Energy NASCAR Cup Series playoffs. The green flag flies for the Federated Auto Parts 400 at 7:30 p.m. ET this Saturday on NBCSN. Also, with only 0.1 points awarded for each lap led by a driver, the need for a dominator is less important when building a winning lineup. The 400-lap race will only have a total of 40.0 points up for grabs in this category. Take note when building your roster and focus on mid-pack drivers who can climb up toward the front on race day. Here are a few drivers to keep an eye on for Saturday’s race, courtesy of Frontstretch.com's Corey Brewer. Keselowski was the first driver to win his way into the second round of the playoffs following his performance at Las Vegas. The victory was his third in a row and 500th overall for Team Penske. While he hasn’t necessarily dominated those races, he and his team capitalized on both pit strategy and late caution flags. The Michigan native now has harnessed all the sport's momentum and is quickly becoming a favorite for the championship. Keselowski's lone Richmond win came back in 2014 where he absolutely destroyed the field, leading 383 of 400 laps. Since then, he has four top 10s in six races, including a runner-up finish in 2017. He finished eighth here earlier this season. There is no driver on the circuit better at Richmond than Kyle Busch. He started 32nd here back in the spring and won the race, his fifth at the track. He has the best average finishing position of all active drivers, as well as the most wins and top fives. Busch will be a force to be reckoned with this weekend. Harvick wrecked out of the first race of the NASCAR playoffs following a blown tire. Fortunately, he has built up a big enough point cushion where the DNF didn't truly hurt his chances of advancing. This week should be a bounce back effort for the 2014 MENCS champion after earning the pole. He has six top-five finishes in the last eight races at Richmond, including a fifth-place finish in the spring. Hamlin is no stranger to success at Richmond. He has three wins here, including a dominant victory in 2016 where he led 189 laps. His 1,659 laps led at the track are by far the most of any active driver. Running top five or better in four straight races here, Hamlin has not finished outside the top six since the spring of 2015. It's a do-or-die weekend for the No. 11 team after wrecking in Las Vegas. Their NASCAR playoff future depends on them capitalizing on their front-row qualifying effort for this race. The seven-time series champion will be racing for his playoff life for the next two weeks after a disappointing 22nd-place finish at Las Vegas. 2018 has been a year to forget for the driver of the No. 48, but there have been a few bright spots. Richmond just happened to be one of them. Earlier in the season, Johnson managed to pull off a sixth-place finish after starting in 17th. It was fairly similar to his fall 2017 race where he started 20th and finished eighth. Johnson’s patience behind the wheel will benefit him this weekend in the 400-lap race, a track where he's earned eight straight top-11 results. Suarez has only started three races at Richmond at the Cup level, but he has made the most of them. He has finishes of 12th, seventh and 10th here, posting an average finish of 9.7 which ranks him toward the top of the list. He finished eighth at Las Vegas, rebounding from a couple disappointing results that cost him a NASCAR playoff berth. Suarez's future remains uncertain in the sport for 2019 and a Richmond upset could really help his cause. McMurray was one of the fastest drivers on the track last weekend at Las Vegas. He was also the first one to break in the high groove at the 1.5-mile track. Ir was both beneficial and detrimental to the outcome of his race. He was able to hang with the fastest cars up front because of that lane selection, but his choice also sent him into the wall at one point, ruining any chance of the finish he deserved. It was also announced that McMurray will not be returning to the No. 1 car in 2019 in recent weeks. That means he is racing with nothing to lose, then and could get aggressive in what's potentially his final Richmond NASCAR start. Byron only has one career Richmond Cup race under his belt at this point, but in his debut earlier this season, he finished a respectable 12th. He also started ninth and that’s where he ran most of the race. The MENCS rookie proved, then that he was quick to figure out the uniquely-shaped track. 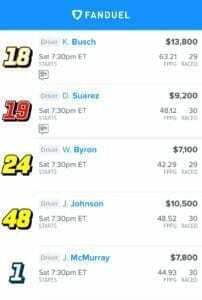 At $6,100 on FanDuel, a possible repeat of the earlier Richmond race would be more than enough reason to add him into a lineup.